Stretch slowly, until you feel a pull in the muscle. Don’t bounce. These exercises are designed to lengthen your chest (pectoral) muscles which have a tendency to get tight with desk based and physical work. Tightness in these muscles can be a precursor to neck pain. 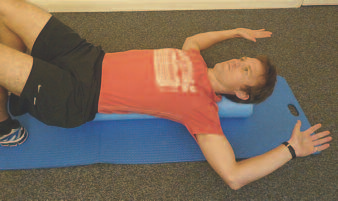 Lie on a foam roller or rolled towel positioned along the length of the spine. Make sure your spine is in a neutral position by having the back of your neck long and flattening your lower back in to the roller. Caution: if you have a history of shoulder instability check with your Chartered Physiotherapist before doing these exercises. 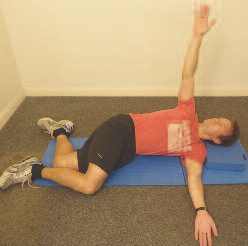 Lie on your back with your knees bent and your arms up at 90 degree and your elbows straight. Open your arms into a crucifix position. Feel the stretch across your chest. a) Scissor action with the arms. Bring both arms above head in to a backstroke position. 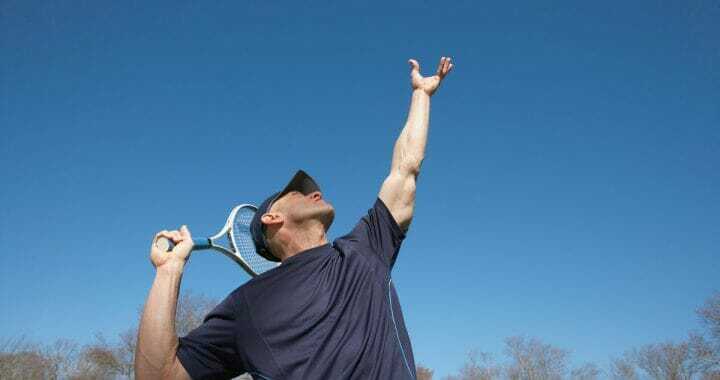 Reach as far as you can – you should feel the stretch under your arms. Bring your arms back to the starting position imagine you are pulling through water. 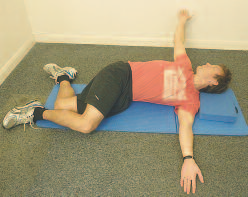 Lie on your back with your arms in the starting position as shown. 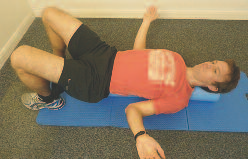 a) Use light weights to create a dynamic stretch. Open your arms out in to a dinner fork position. Feel the stretch across your chest. 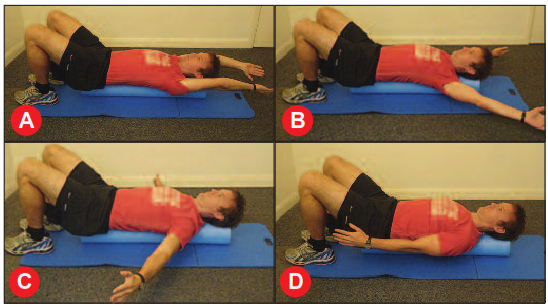 Modification a) Use light weights to create a dynamic stretch. 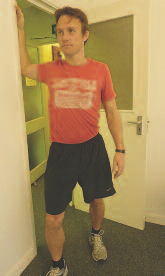 Stand in the edge of a doorway with your elbow bent and your arm lifted out to the side to 90 degrees or above. Walk through the doorway leaving your arm behind. You should feel a stretch across your chest on that side. 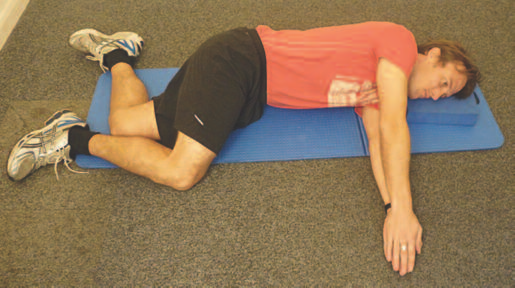 Lie on your back in the starting position as shown below with your elbows by your side and bent to 90 degree angle. Open your arms to so that the palms face the ceiling. Feel the stretch across your chest. 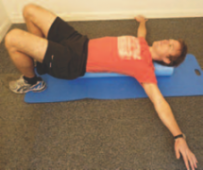 These exercises are designed to mobilise the mid back (thoracic spine) which has a tendency to get stiff with bad posture and desk based work. Stiffness in this region can also lead to neck pain. Lie on your side with your knees bent and your head supported by a small pillow. Place both hands in a clap position. Slowly lift the top arm towards the ceiling . . .
. . . turning the trunk to face the ceiling at the same time. You should feel a stretch across your chest on the uppermost arm. 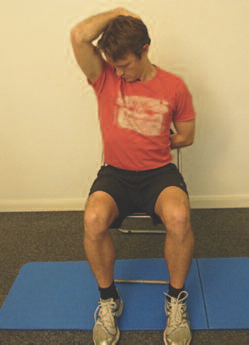 Thread the Needle (mid back stretch) Position as shown below on your hands and knees. 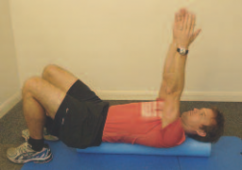 Reach under your trunk with your arms until you feel a pull in your shoulder blade region on the same side. Hold for 5 seconds. 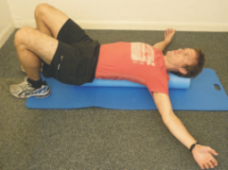 Lie on back with knees bent and spine perpendicular over the roller. 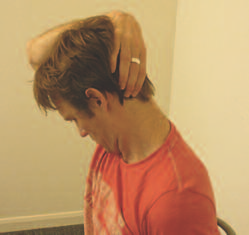 Maintain a neutral neck position by keeping the chin tucked and back of neck long. 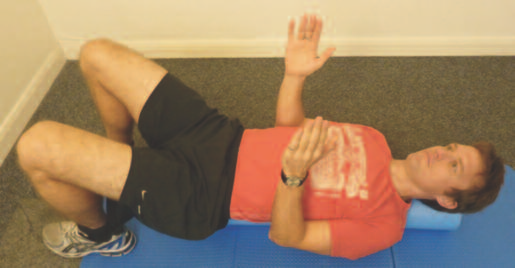 Protect the lower back by pressing it into the ground (think of tucking in your tail bone). 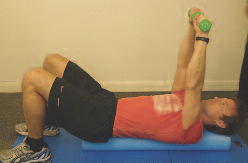 Perform a reverse sit up action by letting your body roll back over the roller. 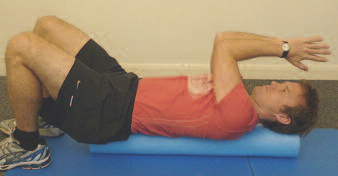 You can move the roller up and down the mid back (shoulder blade region); avoid the lower back. You may wish to try straightening the arms to see if you get a better stretch. If you have neck pain or issues, use a pillow behind head to prevent the neck overarching. 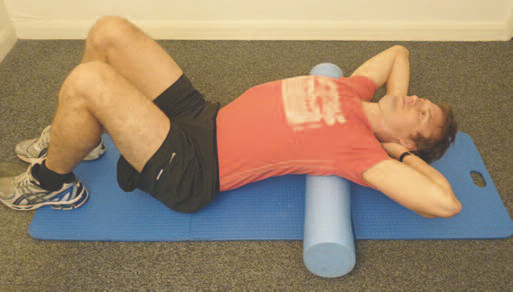 Use a towel instead of a foam roller if a more gentle stretch is required. Look down and to the shoulder keeping your chin in. Lift your arm on that side over your head and lift the base of your skull (do not pull down on your head). The other arm should be behind your back or holding on to the edge of the chair. You should feel a stretch in your neck.